What’s made it the most dominant sport ATV of the early 21st century? During the design and development of the 2006 Yamaha Raptor 700R, a lot was going on in the ATV industry. Yamaha’s R&D department was heavily involved in the 450cc high-performance class, with the release and continued development of the original YFZ450 race machine. Meanwhile, Yamaha R&D was working on another secret project to replace the rapidly aging Raptor 660. The new 700 benefitted from what Yamaha learned from the 660 in addition to directing testing with their race team. The result was a machine infused with YFZ450 design, plus technology not available on even the 450cc race machines of the time like fuel injection and a hybrid steel and aluminum chassis. Fully adjustable suspension headlined a list of other, less significant updates in 2008. By 2013, assembly was moved to the US. That year brought about new front-end styling. The front fenders were moved forward 50mm for more leg room, and the top of the gas tank was flattened. 2013 also brought about a dual piston rear brake caliper, new lighter Maxxis tires, and the aluminum wheels received a new rolled lip for a reduction in weight and an improvement in strength. was a machine infused with YFZ450 design, plus technology not available on even the 450cc race machines of the time like fuel injection and a hybrid steel and aluminum chassis. Throughout its life, the 700 has not been without big-bore challengers. Many have come and gone including the KTM 505 and 525’s; Polaris 525 S and IRS; Honda 700XX; and Kawasaki KFX700. Lean economic times meant less money to go around. While its competitors starved for sales, the Raptor 700 remained at the top of the food chain as the top seller in its class and one of the top-selling sport ATVs on the market each year since its introduction. While it wasn’t designed as a competition machine like the YFZ450R, the Raptor 700 has won nearly every magazine shootout it’s entered for nearly a decade! Wanting to better understand the Raptor’s unsurpassed success, we assembled a panel of four very different enthusiasts to ride and evaluate the machine. 27-year-old Aaron Meyer raced National Motocross for 8 years, competing up to the Pro Am and Pro level. He also has testing experience with most of the newer sport models. Rob Ray is a 41-year-old expert level ATV rider who rides dirt bikes, quads, and races vintage three-wheelers. 53-year-old Joe Hunt has owned and ridden literally dozens of various street bikes. He has some dirt bike and limited utility ATV experience. This test will be his first time ever riding a sport quad. 24-year- old Lauren Grzanke owns dirt bikes and a 450cc sport ATV. She races cross country on bikes, but is just starting on quads. 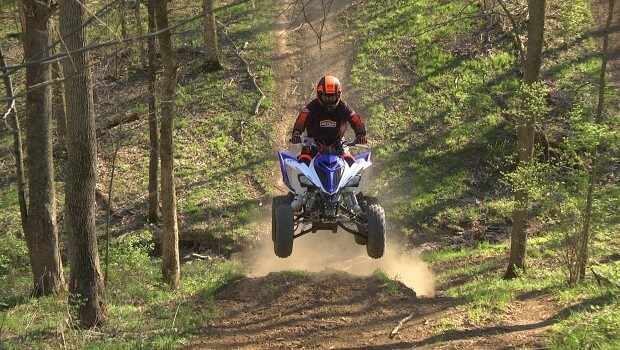 Our test took place at the privately owned Meyer Land Motoplex in southwestern Ohio, which provided plenty of tight, hilly, jump-filled trails, combined with blisteringly fast high-speed meadow trails. This location offered plenty of riding opportunities for our riders’ varying skill levels. The Raptor 700’s engine combines modern four-stroke design with a blend of horsepower and smooth power delivery that’s uncommon on today’s high-performance four-strokes. The Raptor 700’s engine combines modern four-stroke design with a blend of horsepower and smooth power delivery that’s uncommon on today’s high-performance four-strokes. The water-cooled engine features a 102.0mm bore and 84.0mm stroke for a displacement of 686cc. The head features a high-performance, four-valve, single overhead cam design. A forged piston, connecting rod, and crankshaft help keep reciprocating mass down for quicker revving, while dual counterbalances make the machine virtually vibration free. Yamaha opted to keep compression on the conservative side at 9.2:1. Less compression will help it live longer and easily digest a sometimes inconsistent diet of premium pump gas. Electronic fuel injection is delivered via a 44mm throttle body. A digital TCI with 16-bit electronic control unit, controls the fuel injection and ignition for consistent performance regardless of weather or elevation. Electric start brings the engine to life with plenty of cranking power. It can take a few minutes for the engine to warm up thoroughly; however, once it does, it runs flawlessly. The transmission features a five-speed gearbox with reverse, controlled by a smooth operating manual clutch. Shifting into reverse is accomplished by pulling in the clutch, turning a knob on the right front fender, and shifting down from first. To return to first gear, pull in the clutch and shift up. An O-ring chain handles final drive duties. Ample and Smooth are adjectives that best describe the Raptor’s engine. Ample and Smooth are adjectives that best describe the Raptor’s engine. Lauren was apprehensive about riding a sport ATV with an engine this large. With a little caution and the Raptor’s flawless power delivery, she quickly became comfortable with the engine. Accustomed to riding big street bikes, Joe was surprised how manageable the Raptor’s engine is. Already accustomed to manual shift motorcycles, Joe felt the manageability of the Raptor’s engine allowed him to focus on learning the ropes of sport quad riding, while offering enough power that he would never get bored. Lauren was apprehensive about riding a sport ATV with an engine this large. With a little caution and the Raptor’s flawless power delivery, she quickly became comfortable with the engine. Aaron and Rob were fans of the Raptor’s strong low end torque and midrange power. Both riders tackled the steepest climb on our test course, going back and forth between crawling up the hill’s face at slow speed, lugging the engine, and ripping up the incline in the meat of the power. The Raptor revs well for a big bore. Excellent throttle response and a super broad powerband makes power-slides and wheelies a snap with no need to slip the clutch. There’s plenty of power for advanced riders to tackle some impressive leaps, while the lower RPM’s focus on power and smooth delivery make a less experienced rider’s first leaps far less intimidating and sketchy than on a jittery, abrupt 450. Excellent throttle response and a super broad powerband makes power-slides and wheelies a snap with no need to slip the clutch. Although the 700 revs to 9000RPMs, we never heard our riders bouncing off the rev limiter. While our faster riders found power plentiful, they also felt that it signed off on top. Operating in the bottom and midrange of the power will add reliability to the engine. Still, Aaron was wondering what a pipe, fuel manager, and intake would do for the engine. Racers always want more power, whether they need it or not. The transmission drew praise from all of our testers. Rob appreciated how first gear was lower than on his 450, which allowed him to crawl up hills and through tough sections without slipping the clutch. Lauren found the Raptor’s clutch pull light and smooth despite it being an issue for her on other machines. 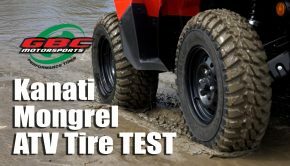 All of our testers felt the Raptor shifted well and drew praise for its narrower-spaced first through third gears and taller fourth and fifth gears. This setup lets you rip around tight trails, while offering a blistering top speed. The Raptor was the first sport quad to utilize a hybrid aluminum and steel chassis, which Yamaha says increases strength while reducing weight. The frame’s front-end geometry is very similar to the fast and accurate steering YFZ450. The Raptor was the first sport quad to utilize a hybrid aluminum and steel chassis, which Yamaha says increases strength while reducing weight. The frame’s front-end geometry is very similar to the fast and accurate steering YFZ450. It’s so similar, that companies like Walsh Race Craft use identical a-arms for both the Raptor 700 and the YFZ450. The lower a-arms, steering stem, axle, plus the frame’s front section and lower rails are constructed of steel. The rear frame section and removable subframe are constructed of lightweight aluminum, in addition to the upper a-arms, and cast aluminum swingarm. The light, rigid swingarm features an eccentric chain adjustment system for easy chain adjustments. The 700 measures in at 45.5 inches wide, with a wheelbase of 50.4 inches, and a 32.7-inch seat height. Its wheelbase is identical to the original YFZ450–– it’s 0.6 inches narrower and its seat height is 0.8 inches taller, allowing the rider to slip through the trees and get in and out of the saddle a little more easily on long rides. 21×7-10 front and 20×10-9 rear Maxxis tires, developed specifically for the Raptor, are mounted on light aluminum rims and yield 4.4 inches of ground clearance. The 700R’s suspension is on par with 450cc class machines, in terms of travel and component quality. All three shocks feature nitrogen reservoirs for improved cooling and less fade on long rides. Both ends feature preload, plus high and low speed compression, and rebound damping adjustment. The 700R’s suspension is on par with 450cc class machines, in terms of travel and component quality. All three shocks feature nitrogen reservoirs for improved cooling and less fade on long rides. Both ends feature preload, plus high and low speed compression, and rebound damping adjustment. Enthusiasts who don’t want to mess with suspension settings can save $500 by going with the base model Raptor 700 which comes without front reservoirs or compression and rebound adjustment. We feel the adjustability of the R’s shocks is definitely worth the extra $500. Whichever model you choose, the Raptor features 9.1 inches of wheel travel up front and 10.1 inches out back. That’s more travel than half the 450cc class and any other sport model. Completely laden with all fluids including oil and its 2.9 gallons of fuel, the Raptor 700R weighs 422 pounds, 3 pounds less than the Suzuki 400cc Quad Sport. Dispite being a larger sport ATV, our two lightest riders, Lauren and Aaron both thought the Raptor felt surprisingly light out on the trail, thanks to its easy, agile, and accurate steering. Dispite being a larger sport ATV, our two lightest riders, Lauren and Aaron both thought the Raptor felt surprisingly light out on the trail, thanks to its easy, agile, and accurate steering. Rob compared the Raptor’s steering to a motocross machines, thanks to its quick precise steering. Although the machines steering is a little touchy at top speed, the Raptor drew praise for its high-speed stability. Body roll in turns and on side hills is minimal, thanks to the 700’s excellent suspension settings. Lauren felt more comfortable on the 700 than she does on her TRX450 on sde-hills. 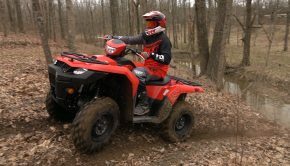 its taller engine and seat height: combined with its 45.5 -inch width means that the machine can two-wheel a bit easier in turns than Yamaha’s nearly 49 inch wide YFZ450R, or 46-inch wide YFZ450, with its lower center of gravity. Our fastest riders noticed the machine’s higher center of gravity more, as they were driving the machine harder into turns. As the heavier rider, Rob was able to counterweight the Raptor in turns more effectively. This is one area where the machine really works better for a larger, or heavier rider. Cornering stability is good, and for times when you do feel like it might start to bicycle, you can just snap the gar, break the back end loose, and drive it through the turn sideways on all-four. Rob compared the Raptor’s steering to a motocross machines, thanks to its quick precise steering. ornering stability is good, and for times when you do feel like it might start to bicycle, you can just snap the gar, break the back end loose, and drive it through the turn sideways on all-four. The weight balance and wheelbase of the Raptor keep the front end planted on climbs, yet it can be wheelies on demand. Rob felt that the machine felt well balanced in the air as well. The Raptor 700R’s suspension is simply amazing. After some initial testing, we added just a bit of preload to the Raptor’s rear shock and backed out four clicks on the front shocks low-speed compression damping, which nearly perfectly balanced the ride. Its almost inconceivable that suspension could serve such varying weights so well. Under Lauren’s 115 pounds, the shocks absorbedand kept the wheels tracking over the smallest imperfections in the trail, while never bottoming under Rob’s 205 pounds, despite the fact that he was going bigger than any of our test riders. Aaron was surprised how plush the shocks action was over typical trail obstacles, while easily dealing with the jumps he threw at them. Not knowing what to expect, Joe felt the suspension kept him sheltered from bumps and made up for his novice mistakes. Once dialed in, the suspension did everything well for all of our riders. For well-rounded performance, the Raptor features brakes that match the power of the engine. It’s slowed by hydraulic disc brakes at both ends featuring drilled rotors for improved cooling, while dual-piston calipers front and rear provide stopping power. Rob and Aaron both praised them for their power and feel. Lauren felt the brakes performance greatly added to her confidence on steep downhills. Joe nearly wadded up the machine overcooking a corner with a tree at the apex. Fortunately, the brakes and a quick turn of the handlebars allowed him to skim past. Rob and Aaron both praised them for their power and feel. The Raptor has always been known for its roomy ergonomics, which improved in 2013. The seat is long, relatively flat, and well padded. Again, its slightly taller height compared to most 450s, makes getting in and out of the saddle for aggressive riding easier on long rides. The front brake lever features adjustable reach, and the 45mm wide pegs offer comfortable and secure footing. ck All of our test riders looked nearly as fresh at the end of the day as they did at the beginning thanks to the Raptor’s high comfort level. All of our test riders looked nearly as fresh at the end of the day as they did at the beginning thanks to the Raptor’s high comfort level. All of our riders praised the feel and placement of the controls. Lauren felt the bars seemed a bit far away at first, however she quickly adapted to it. If it had been a problem for her, a quick bar adjustment, or change to a different handlebar would have been a quick fix. The seat drew praise for its plushness and all of our test riders liked how easy the transition from sitting to standing was, even after a full day of riding, thanks to the slightly taller seat height. The machines sides are easy to grip with your legs, with no uncomfortable seams or bumps and our most aggressive rider, Aaron, felt there was ample knee room provided by the front fender. We spoke at length with a few aftermarket engine and chassis specialists regarding the Raptor 700’s long-term reliability. From what we’ve learned, the chassis holds up well to typical sport riding abuse. 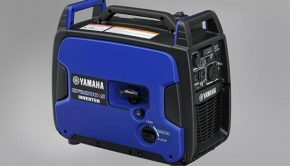 Motor builders are reporting getting 60 and 70 horsepower out of the engine reliably, so stock to lightly modified engines should be nearly bulletproof with routine maintenance, thanks to their robust build quality and high-torque, less RPM-focused power delivery. exceeds expectations regardless of skill level, is a thrill to ride, and the biggest disappointment we’ve found with it is that there is not more time to go riding. Four riders, with four very different experience levels, ages, and body types; none had ridden the Raptor 700R before, yet all come away with very similar overall opinions for very different reasons. Those with less experience found the big engine friendly and manageable, while those with more experience felt there was plenty of power in stock trim. Our lightest rider found the suspension pleasantly plush on small bumps, while our heaviest rider was attacking jumps and never feeling the suspension bottom. The more time our riders spent on the Raptor, the more they got excited about riding it. When the day was done, all commented on how comfortable the machine was and how surprised they were that they weren’t tired or beat up. It’s no wonder why the Raptor 700R has been the most dominant sport ATV of the early 21st century. More than just a big engine, it’s as close to the perfect sport ATV as you can get for the largest number of riders. It exceeds expectations regardless of skill level, is a thrill to ride, and the biggest disappointment we’ve found with it is that there is not more time to go riding. Summary: It’s no wonder why the Raptor 700R has been the most dominant sport ATV of the early 21st century. It exceeds expectations regardless of skill level, is a thrill to ride, and the biggest disappointment we’ve found with it is that there is not more time to go riding.